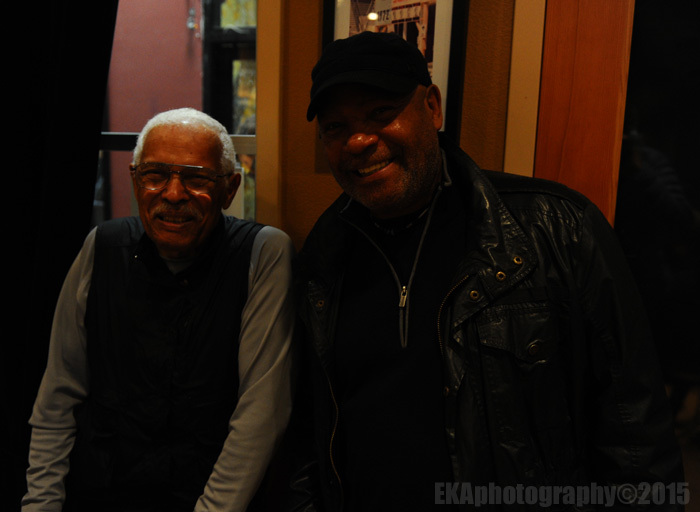 As Seale, now 78, spoke to an audience which included former Panther Minister of Culture Emory Douglas and Joan Tarika Lewis, the organization’s first female member and a violinist who works with youth, he was surrounded by images of himself taken almost 47 years ago, during a 1968 Panther rally in Defremery park. To look at pictures of Seale in 1968 while being addressed by the 2015 version of the man was the very definition of epiphany. The photos, which have never before been exhibited publicly, were shot by Henry Raulston, a former Army photographer who joined other local photographers to form the Association of Black Photographers in 1967. Using a Nikon F and Tri-X film, he set out to document rallies, demonstrations, and community gatherings in Oakland. The Panthers, he said, were “doing something to build the people up.” With cultural arts also taking radically progressive turns, activism became infectious: “There was this vibe of, ‘what can we do'”? Raulston’s exhibit, “Seizing the Time,” presents 35 prints–many of his negatives were lost due to improper storage, he said–which not only capture a young, charismatic Seale, but other Panther leaders like Stokely Carmichael, Eldridge Cleaver, and Kathleen Cleaver, as well as Brown Berets–whose presence emphasizes black-brown unity–who’d traveled up to Oakland from Fresno for the rally. There’s an iconic shot of Carmichael and Seale together, appearing hopeful and determined; another of three Afro’d women raising their fists in front of a banner which reads “Free Huey.” Collectively, Raulston’s unearthed treasures paint a picture of a cultural community for whom activism was intermingled with the creative arts. 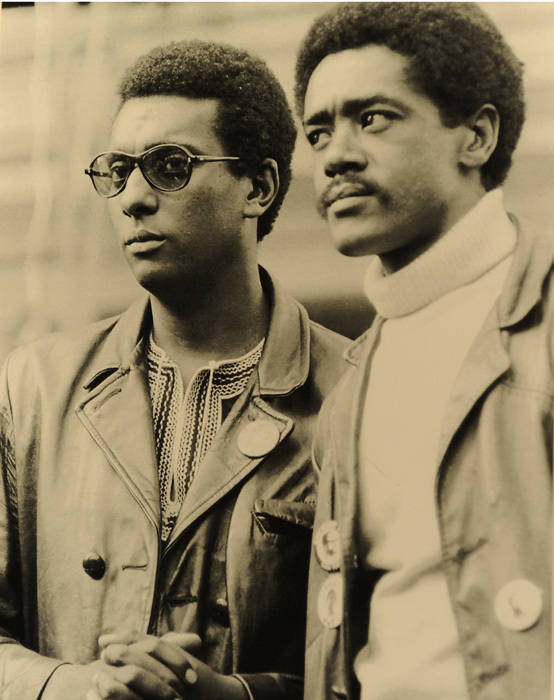 Even the Panthers’ sartorial choices—dashikis, turtlenecks, berets, leather jackets, sunglasses—reflect a stylistic awareness and implicit coolness which counterbalance their fiery radicalism. 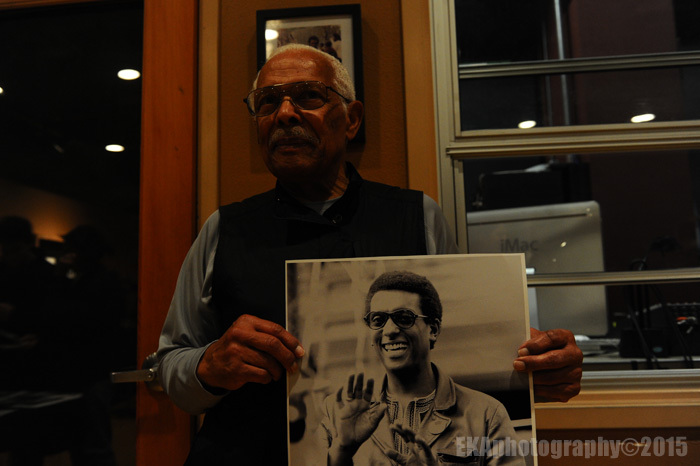 Henry Raulston with a photo of Stokely Carmichael. More than a decade after Gates curiously called BAM “the shortest and least-successful” African American artistic movement in history, the extent to which it represents a critical link in the black cultural continuum has become more clearly visible – in part because there’s a more defined sense of intergenerationality than existed in the Clinton years, in part due to the maturation of the hip-hop generation, but also because of the repetition of some of the same social and political issues which initially informed BAM, such as police brutality and the need to organize communities around unequal justice. It’s also been posited, most recently by Berkeley author Jeff Chang in “Who We Be,” that the election of Barack Obama in 2008 was one of the long-term impacts of four decades of POC-driven cultural movements, of which BAM was both catalyst and seminal influence. The movement was a national one. 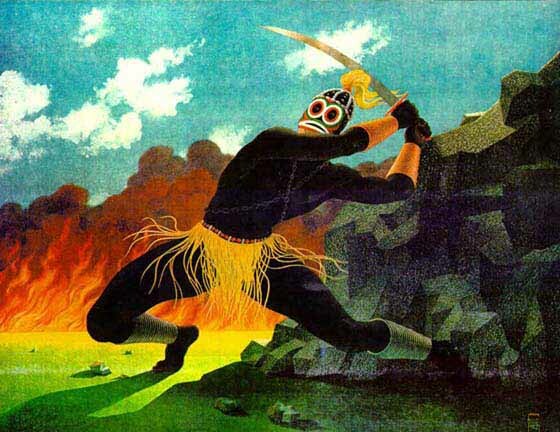 In the Bay Area, Marvin X founded Oakland’s Black House Theatre and SF’s Black Arts/West, while Douglas’ illustrations graced Panther newspapers and political posters. 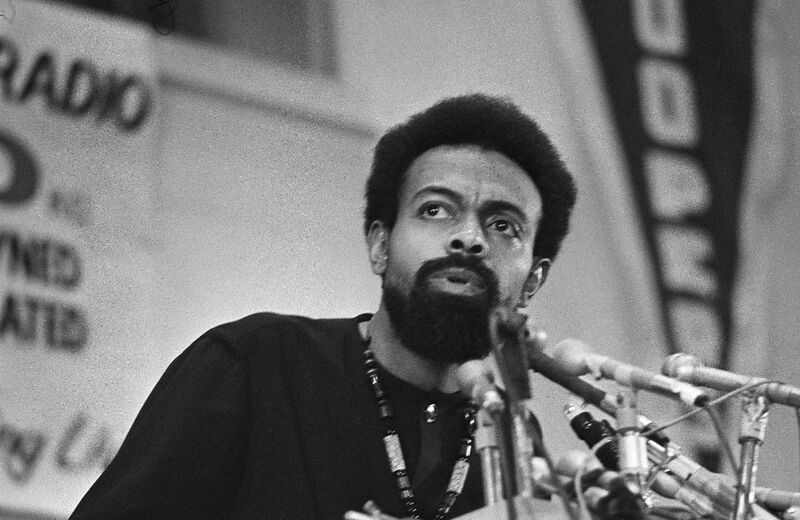 On the East Coast, Amiri Baraka founded the Black Arts Repertory Theater in Harlem in 1965, following the assassination of Malcolm X – an event which was also instrumental in the founding of the Black Panther Party. Repercussions were soon felt in other “chocolate cities” like Detroit and Chicago, which established their own black threater companies and literary journals by the late ’60s. 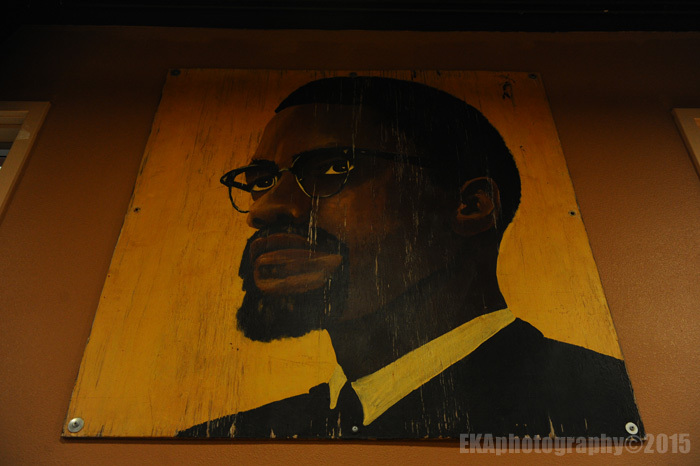 BAM was multi-disciplinary, covering music, visual art, theater, literature, spoken word, even film. It informed a generation of brilliant poetic, literary, and musical minds, including Nikki Giovanni, Ishmael Reed, Gil Scott-Heron, Sonia Sanchez, Ntozake Shange, the Last Poets, the Watts Prophets, Sun Ra, Archie Shepp, Maya Angelou, and John Coltrane. And its reverberations have continued to echo for five decades, influencing later generations of black artists as well as other marginalized demographics including Latinos, Native Americans, Asians, and LGBTQ folks, paving a creative path for a multicultural, post-millennial arts scene which has given rise to innumerable individual voices in each of the disciplines BAM touched, as well as a collective consciousness which emphasizes community-building along with social activism. Locally, the combination of BAM, the student-led Third World Movement, and the Black/Brown Power dynamic of the Panthers, Brown Berets and Chicano farm workers created intersectionality between arts and activism which remains one of the defining, if not THE defining characteristic of the Bay Area’s multicultural arts and culture scene, particularly in the East Bay and especially in Oakland. As Morozumi pointed out, the currency and relevancy of BAM can be seen in the current conversation over “race relations” – which he said is really about “systemic racism and oppression” – and the reaction of Oakland’s artivist community to those challenges. Black History Month is always an auspicious occasion, as February’s 28 short days are suddenly filled with an outpouring of African American cultural arts programming which isn’t so visible the other 11 months out of the year. 2015’s BHM seems especially crucial, what with the aforementioned national conversation about race in the wake of the Ferguson situation and the #BlackLivesMatter campaign, as well as the 50th anniversary of the BAM – which will be celebrated in an all-day symposium Feb. 7 at Laney College. The role art plays in social movements is a crucial one, and part of a cultural continuum. We can trace history to see how visual artists like Douglas inspired contemporary political art by Favianna Rodriguez, Spie TDK, Refa 1, the Dignidad Rebelde and Trust Your Struggle collectives, or how Morrie Turner’s groundbreaking “Wee Pals” comic strip preceded Jesse Jackson’s Rainbow Coalition by two decades. Cultural and social statements, like those rendered by Karen and Malik Seneferu in “Black ❤ Matters,” their current exhibit at Impact Hub’s OMI gallery (which hosts an artists’ talk Feb. 6 ) are just as important as overtly-political imagery. Just as Stone’s “Thank You For Talking to Me Africa” opened up a dialogue with the cultural motherlode, the connection to the Continent has been advanced by Oakland soul singer Candice Antique Davis, who collaborated with native hip-hop artists during a recent trip to Ghana (she’s scheduled to talk about her experiences in Ghana Feb. 9 at 8pm on KPFA’s “Transitions on Tradition” program ). Antique also recorded her new single, “Freedom Song (This Song),” in Ghana. The song’s lyrics reference Baraka as well as Audré Lorde, Bob Marley, Harriet Tubman, Malcolm X, Kwame Nkrumah and other freedom fighters/revolutionaries/icons. “It seems to me this song is for revolution solution,” she sings. “Freedom is coming,” she promises. The Panthers’ impact on music is reflected not just in the funk band The Lumpen (chronicled in Rickey Vincent’s book “Party Music”), but also through 70’s soul singers Stevie Wonder, Marvin Gaye, and Curtis Mayfield, who expanded their lyrical topics to address what was going on at that time. 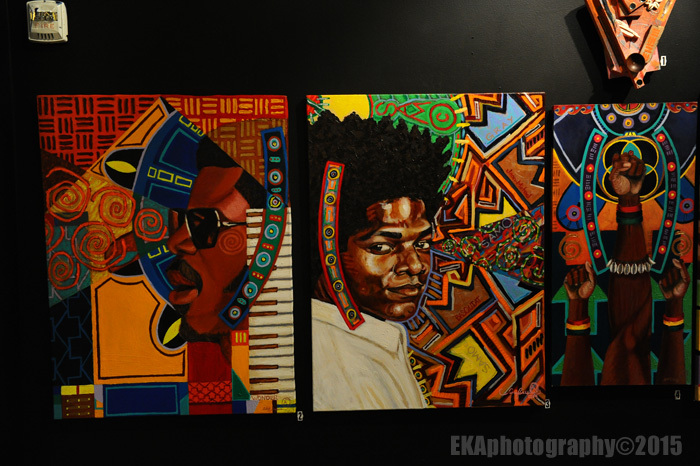 The Panthers also had a direct influence on Fela Kuti and the development of Afrobeat, and established a blueprint for politically-minded, socially-conscious hip-hop from Public Enemy to KRS-1 to Tupac to dead prez to current Oakland artists like The Coup, Kev Choice (who debuts his new album, Love + Revolution, Feb. 5 at Yoshis), and Jahi (who heads up the second iteration of Public Enemy, PE2.0). 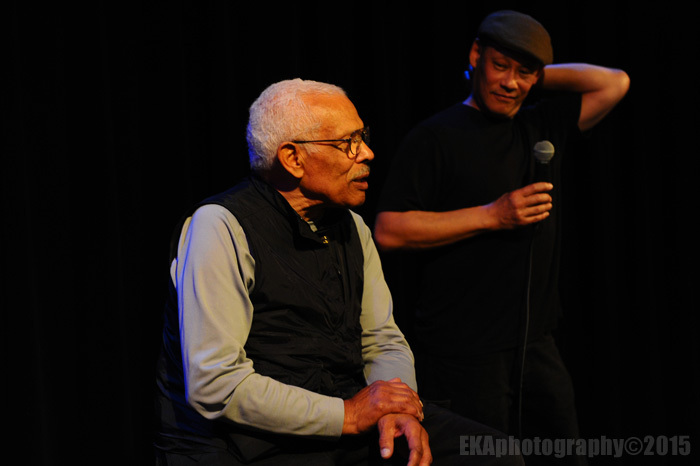 The emphasis on theater and literary works which played such a large role in BAM continue through the Laney tribute, which includes a black women writers’ panel and a performance of Marvin X’s play “Flowers for the Trashman,” as well as the African American Shakespeare Company’s adaptation of Sophocles’ “Antigone,” retitled “Xtigone” and starring Oakland emcee/poet/actress RyanNicole in the lead role, directed by Rhodessa Jones and with musical direction from Tommy Shepard (“Xtigone” opens Feb. 14 at the African American Art and Culture Complex in SF). 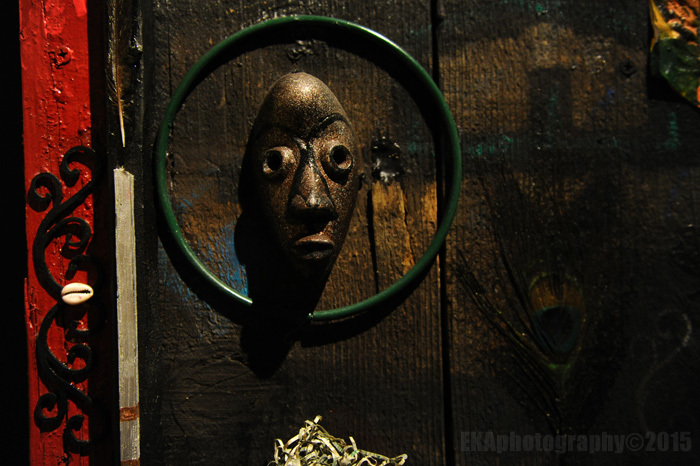 Aesthetically-speaking, it doesn’t get much more artistic than updating a classic Greek tragedy, and, as West African academic and playwright Wole Soyinka has pointed out, tragic dramas are directly descended from primal sacrificial rituals prevalent in pre-Christian European history, and similarly extant in African culture and mythology. The orisha Ogun, Soyinka has asserted, was the first actor; the ritual-myth tradition the origin of what we now call the dramatic arts. Which brings us to another point about the black history/black art continuum: Not only is the artivist paradigm one of Oakland’s unique features, differentiating it from other similar urban cities, but “The Town” is also a repository of ashé, the universal life force conceptualized by the Yoruba and other West African peoples. Poet/playwright Ishmael Reed and cultural historian Robert Farris Thompson have connected ashé to the development of black art and Afro-Disaporic culture in the Americas and Caribbean (which in turn has informed American popular culture in a multiplicity of ways). Oakland’s vibrant Afro-Diasporic community is perhaps most visible around drumming and dance, but can also be seen in the colorful, Afrocentric visual art of the Seneferus, which creates ritual space and honors tradition. Ashe also manifests through the music of New Orleans and the Mardi Gras festival, which just happens to coincide with BHM. Mark your calendars now for the two-day Mardi Gras fete, which begins with a second-line parade at Awaken Café followed by a free concert at the New Parish, and continues the next day with a Katdelic show which also features NOLA-style bass bands. All of that is to say, it’s important to recognize that black history isn’t just in the past and is actually a still-evolving, still-living thing. Not only is tradition continually being referenced across the artistic spectrum, but major cultural works are still being created today by contemporary artists. Baraka may have become an ancestor, but his legacy lives on and continues to inform us today. And while artivism is in of itself a form of cultural resiliency against oppression, it’s also important to note that there’s just as much positive, live-affirming creative expressionism as reactionary measures. And all of it matters. On that note, Hodari Davis, co-founder of the Life is Living festival, has announced a month-long series of events happening during BHM called “Life is Loving” which he says establishes an alternate narrative to the “we’re angry and upset” stance which has framed the African-American dialogue around race. Focusing on love as an aesthetic concept and a manifestation of art transcends politics, and, he hopes, may even ultimately overcome societal and economic barriers which continue to limit the black experience in America. Got all that? Good. It’s gonna be an incredible month for black art in Oakland and the Bay Area, and Oakulture will try to cover as much of this dynamic ashe, love, and artivism going around as is physically and logistically possible. Bookmark this site now if you haven’t already, and return early and often throughout February for the latest updates. 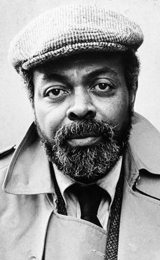 Categories: Art review, Black History Month 2015, Music Review | Tags: Amiri Baraka, Black Arts Movement, Black History Month 2015, Black Panther Party, Bobby Seale, Candice Antique Davis, Greg Morozumi, Henry Raulston, Hodari Davis, Ishmael Reed, Jahi as PE2.0, Kev Choice, Marvin X, Robert Farris Thompson, Wole Soyinka | Permalink.